This hop is sponsored by the fabulous Spectrum Noir!! You should have found your way to me by the uber talented Isha! I am sure she had something fabulous to feast your eyes on! For my card - I went a simple route. I was thinking ombre all the way! This month we are inspired by Warm Grays and Pinks - so I took a few of the warm gray markers and colored from lightest to darkest on my white card stock. This is pretty much a one layer card minus my sentiment :) After getting the grays down I took the Chevron Backdrop stamp set and stamped the thicker of the chevron stamps in Memento Luxe Pigment inks in Rose Bud, Love Letter and Lilac Posies. For something "extra" to my chevrons I just added a stitched detail with my Memento Tuxedo Black marker. For my sentiment I stamped the 'Thinking of You' speech bubble from Chit Chat, and inked that up in the Lilac Posies and Love Letter inks again, and then die cut it out using the coordinating die and of course it screamed " I need shimmer" so I used my clear Wink of Stella to do just that! To finish off the card I rounded the corners with my We R Memory Keepers Corner Chomper with the 3/8" setting. It wouldn't take no time at all to whip up a few of these to keep on hand :) Well, its time for me to send you off on the next stop...my girl Lenny! 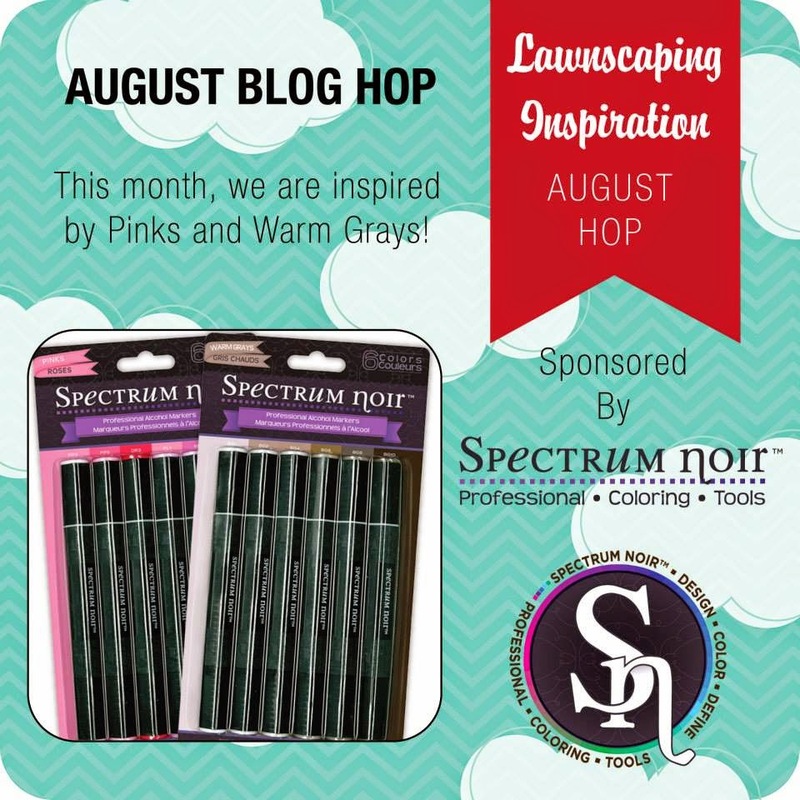 Be sure to leave comment love along the way for a chance to win some of these awesome Spectrum Noir Markers!! CAS and simple ... pretty!! Love the ombre effect, Kari! Simple and clean take on the card, lovely ombre touch! The pink cloud adds a great pop to this ombré effect! Like the chevron zig zag pattern & coloring. Such a fun and CAS card! Very pretty. Love the graduating dark to light colors. Very pretty card, great colors. What a fun card Kari! I love the ombre effect with the chevron stripes! What a fun and easy way to create a background. Think I'll try it out this weekend. great way of combining two very trendy things: chevrons and ombre. 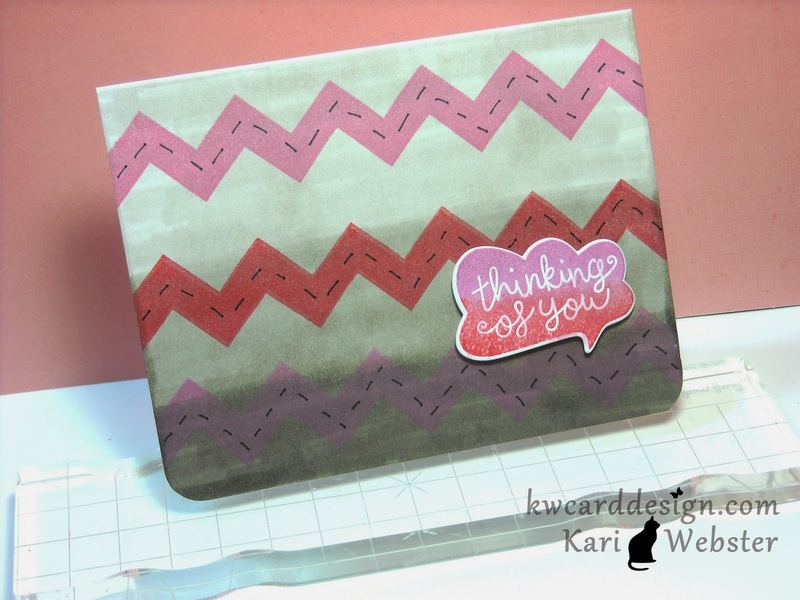 love the two-tone on your sentiment and always love chevrons..
Love the background. A simple but fun card! cute! Love the dash lines over the chevron. I really like those bold chevrons.